“John” was struggling to make ends meet. He was behind in his rent and “Disconnection Notice” was a recurring theme of his utility bills. Out of work for a few months, he was running out of options. He was relieved when he found out a job tip paid off as he was hired for a temporary position that could lead to permanent employment. The problem was he had no transportation, as the city bus did not venture to that area of town. “John” sought assistance at a local agency that, unfortunately, had run out of funds for the day. The agency contacted the United Way of Sierra Vista & Cochise County for assistance in hopes of finding a solution for “John’s” dilemma. The organization is one of more than 30 non-profit organizations representing business, government, health care and social services that partner with the United Way of Sierra Vista & Cochise County. The United Way of Sierra Vista & Cochise County offered assistance to “John” via funds in its Grombacher Assistance Program (G.A.P.) Emergency/Crisis Fund. 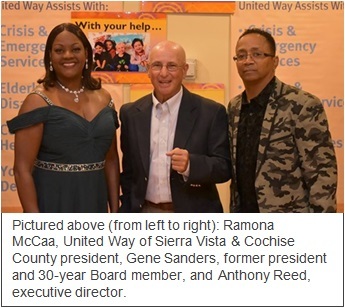 Named in honor of Gerd S. “GG” Grombacher, the founding member of the United Way of Sierra Vista & Cochise County and former Fort Huachuca commanding general, the G.A.P. sets aside $2,500 monthly for community members in dire straits (i.e. home utilities, food, car repairs, etc.) who request assistance through United Way partner agencies – helping to fill in the “GAP”. “John’s” desire to “pay it forward” speaks volumes for the way this community comes together in good and bad times. 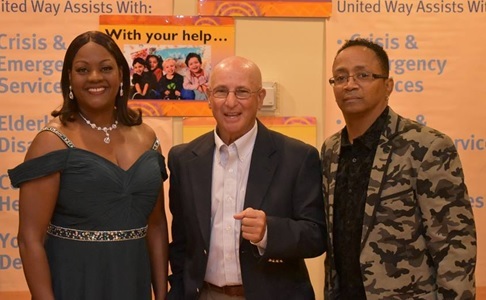 In an effort to help more community members, the United Way of Sierra Vista and Cochise County hosted its 5th Annual Grombacher Assistance Program Benefit Dinner Friday, Nov. 2nd at the Windemere Hotel & Conference Center in Sierra Vista. For more information about how to donate to the Grombacher Assistance Program, or to seek assistance, contact Anthony Reed at 458-3288 or 234-4302 (e-mail uwayofsv@qwestoffice.net). United Way of Sierra Vista & Cochise County held its 5th Annual Grombacher Assistance Dinner Friday, Nov. 2nd at the Windemere Hotel & Conference Center. The program sets aside $2,500 monthly for community members in dire straits (i.e. home utilities, food, car repairs, etc.) who request assistance through United Way partner agencies.